For a full listing of bulls available click on this link 2019 Bull Sale Catalogue You can look on-line or download it or if you want a hard copy please phone or email and we will mail one to you. We have a good batch of heifers this year as well as the twenty one yearling bulls to go in the spring and four older bulls. A $1,500 deposit will hold your pick and the animals need to be picked up by the first of May. Over half of the bulls are already sold but still a good selection of heifer and cow bulls are still available. We always cut any bull calves that do not meet our criteria and/or conformation standards as well as anything out of a cow that we have culled for any reason. Our guarantee is that the bulls all pass their bull tests and will do their job or we will replace them or refund your purchase price. We always have a selection or young and mature cows that do not fit in our breeding program. Nothing wrong with them, they are just excess and Marsha will give you the rational why they are for sale. Anything that we would not keep for ourselves always go for meat. There is a four year old that has had three big calves off of three different low birth weight bulls and as we sell heifer bulls we end up castrating these bull calves as they are not suitable. Excellent docile cow that will let you do anything with her and has her calves easily, great mother. 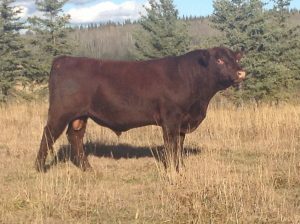 We have three – 3 year old cows that will be having their second calves due late April and early May. They were the last of that years calf crop, good moms that raised great calves but as we are moving up our calving dates they are to late so they need to go. Their calves can be registered as well. There will be others I am sure as we are going to breed 20 replacements so there will be room to tighten up the herd with dispersal cows. We have used 16D on commercial heifers for a couple of years. 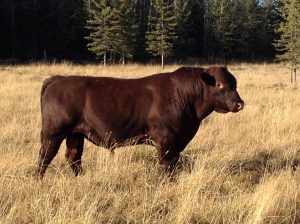 He is out of Adventure DAK 7Y and a Rodeo Dam, he is related to a lot of our cow herd. 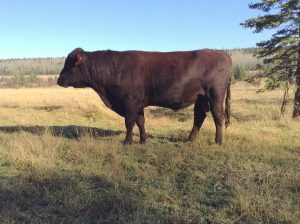 This bull was a 75 pound calf and will throw light weight calves with average milk, his sisters tend to have plump well connected udders. 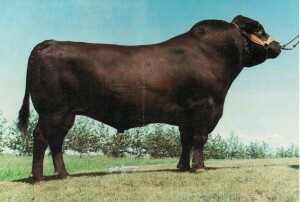 If you want to down size your average cow weight this is a good bull to use. His weight is 1,700 pounds when we vaccinated this winter. We have three coming two year olds, one TARGET EAGLE 12E another DAK 7Y son out of a Rodeo female. 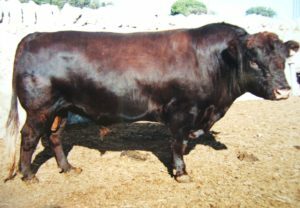 One TARGET EMERALD 28E a Eurimbla Leopold son out of a DAK 7Y daughter, and one TARGET EQUITY 44E a Leopold grandson out of a Rodeo female (SOLD). You can click on any of the bull names and that will pull up their info as well as their EPD’s. 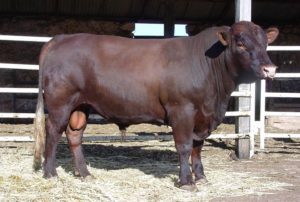 We do not have a picture of Arnold’s son but TARGET DEPUTY 9D is proving to be one of our best bulls that we have raised. He give light birth weight and great milk numbers off of heifers. If you are considering keep your heifers calves then one of the following eight bulls will be a great choice. Three left. Three sons each off of these two Eurimbla Leopold sons. It seems that we get the best cross by going back over females that come out of the Rodeo line. Just very docile well mannered bulls that did their job. These bulls will throw bigger calves at weaning and as mature animals. All sold. We had a great crop of 60 calves last year with a good selection of both heifers and bulls. We have culled the ones that are not up to our standards after weaning so we will see how the balance do this winter. The bull calves are out of four different blood lines with a great selection. I included the EPD numbers that were available for all the younger bulls in the catalogue, click on this link 2019 Bull Sale Catalogue .